Watch the sailboats, marina and lake from all rooms of this spectacular waterfront condo. With the calming nature of the lake, this one bedroom condo is an ideal urban oasis for the busy professional. This rare suite is ideally located in the building, in the west tower facing south. The suite is freshly painted with colours chosen by a designer. 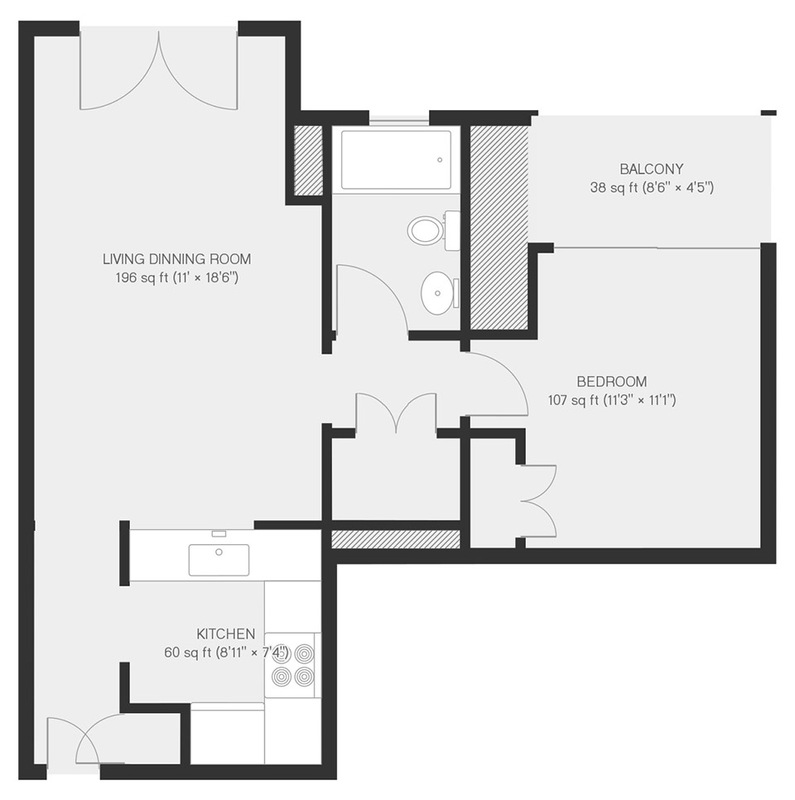 The suite has an efficient layout with no wasted space. An open concept kitchen with breakfast bar and full size appliances makes entertaining easy. The light laminate hardwood flooring in the living room is on trend. The juliet balcony gives the suite floor to ceiling light and sun all day long. The porthole window in the bathroom adds a touch of nautical character to the suite. The bedroom has a walkout to a balcony, an ideal place to sit back and relax as the tall ships sail by. Parking is located by the elevator and the locker is included. All utilities except cable are included in the maintenance fees. Queens Harbour is a low rise condo with two eleven storey towers and 276 suites. Built in 2000, this condo is just about to finish an amenity, lobby and hallway renovation. This is a well managed building with a 24 hour concierge. This condo offers a well equipped exercise room, party room, bbq facilities, library, sauna, one furnished guest suite and ample visitor parking. Pet policy is limited to one dog weighing 30 pounds or less and or up to two cats or two birds or one aquarium. Queens Harbour is surrounded by marina, waterfront boardwalk, gardens, bicycle and walking trails. This condo is a short walk to shops, groceries, Harbourfront Centre, Queens Quay Terminal, LCBO, Loblaws and Porter Airlines. Queens Quay streetcar stop located right at building front entrance. Queens Quay is planned to become one of the world’s most beautiful waterfront boulevards, a bike and walk friendly promenade linking major Toronto landmarks. © 2019 Houman Saffarzadeh Media Corp.